Do you think “black” when thinking of flowers? Then, think again. The use of the color can add dramatic impact to a flower arrangement. Even among brides, the dark shade is becoming more popular, either for a wedding bouquet and reception flower arrangements, such as a mix of black and white flowers. It’s no longer reserved for gothic touches at Halloween. 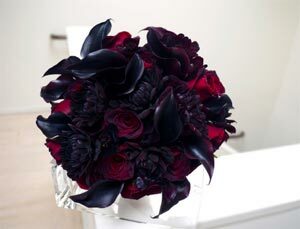 Some flowers give the illusion they are black because their blooms are extremely dark red or dark purple, such as the Schwarzwalder calla lily. 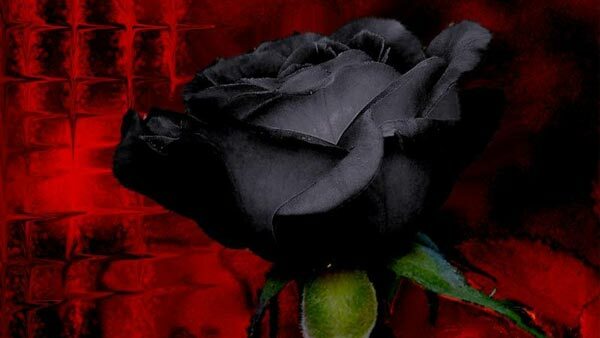 But if you want a truly black flower, you can’t rely on Mother Nature to deliver the color. You have to give her a little help. You can create the black flower of your choice by following one of three techniques, none of which is complicated. You can dye the flowers by placing the stems in dye-enhanced water, dip the blooms in colored stain or spray the blossoms with floral paint. The Internet offers tips on dyeing flowers using food coloring or ink, but that advice is misleading. Such methods may work to a degree, but they aren’t as effective as using professional floral dye, such as Design Master’s Absorbit. Plus, professional dye products won’t inhibit the flowers’ water uptake, ensuring you get the longest vase life for your blooms. To purchase floral dye, ask your florist to order it for you. (He or she can advise you on which colors will mix to achieve the deepest black.) Then ask your florist what blooms work best. Some experts recommend choosing white flowers, but others suggest choosing a dark color, such as red. You may need to experiment with both to determine which one to choose for your project. Leave flowers out of water for at least three hours once you get them home from your florist. When flowers are a bit stressed, they will absorb the dye-enhanced water more quickly. In a container large enough to hold the flowers, add 2-3 teaspoons of floral dye to each quart of warm water (100-110 degrees Fahrenheit/37-43 degrees Celsius). Mix the liquid thoroughly. Remove lower foliage from each stem. Cut stems at an angle with very sharp floral shears or a floral knife. Place the stems into the dye solution. Allow them to sit in the water for 30 to 60 minutes. While you are waiting, prepare a vase for your flower arrangement. Add floral preservative as indicated on the packet’s directions, mixing with the appropriate amount of water. When enough time has passed, remove the flowers from the dye solution and rinse the dye off the stems. Transfer your bouquet to the prepared vase. The color of your flowers will intensify as the dye continues traveling up the stem. If dyeing different varieties, don’t expect the color to be absorbed at the same rate. Woody stems, like roses, take longer to uptake the dye than green-stemmed flowers, like carnations. 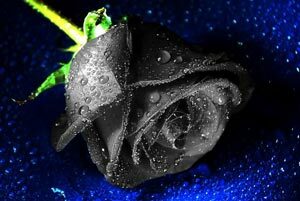 Black roses also may not achieve even coloration unless you maintain the temperature of the dye solution while the stems are in the liquid. With those blossoms, place your container into a water-filled slow cooker on medium heat throughout the soaking period. If color is spotty, transfer roses to a separate container of warm water. Allow them to soak up the plain water overnight to further hydrate and spread the color throughout the petals. Dispose of leftover dye solution by pouring it over newspaper to absorb it. Then toss out the papers with your normal trash. Choose flowers with fully opened blooms so the dye will more easily be able to coat each petal. Pour the liquid dye into a container or bucket with a large opening to ease the dipping process. Dip each flower into the solution for about 2 seconds. Shake off the excess dye, allowing the extra liquid to fall back into your container. Rinse each flower head under a faucet and shake again to remove the excess water. Allow flowers to dry before handling so that you don’t stain clothing or skin with wet dye. If your flowers aren’t as dark as you would like, you can redip them once they are dry. Simply repeat the steps above. As with Absorbit, pour any excess dye over an absorbent material, like newspapers, and then dispose of the papers in the trash. Spraying flowers with floral spray paint is the easiest way to ensure a deep, dark, consistent black color. It’s also the messiest, so be prepared before you start by using drop cloths or newspapers to protect your work area from overspray. Also, make sure the area is well-ventilated, at a moderate temperature (about 70 degrees Fahrenheit/21 degrees Celsius) and not humid. If your local craft store doesn’t sell floral spray paint, ask your florist to order it for you. Design Master makes a line called COLORTOOL that is specifically designed for use on fresh flowers. Regular spray paint is too harsh and heavy for delicate flower blossoms. Shake the can well, before and between uses. Turn the paint can nozzle to line up with the black dot on the rim. Hold the can 15 to 18 inches from the flower head. Spray each blossom, turning the bloom in your hand to get all sides and inside the petals. For darker color, allow the paint to dry. Then apply another coat. Thanks for the article on creating black flowers. More information on creating other colors using dyes and sources of supply can be found on the Design Master website at http://www.dmcolor.com. Continued success. Thanks for the additional info. I’ve heard lots of great things about your products, so I’m sure our readers will find them of interest. Black flowers are very hard to find, Thanks for sharing the tips.